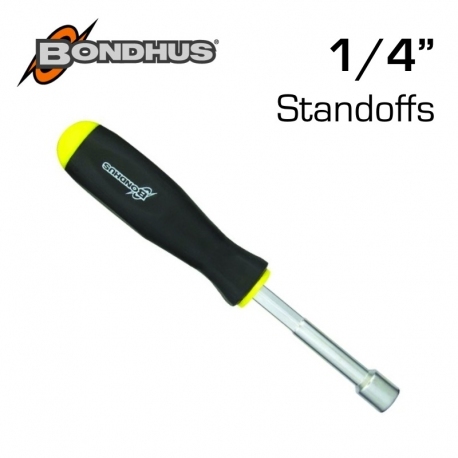 > Tools>Nut Tools>Bondhus® Hollow Shaft Nutdriver 1/4"
Bondhus® Hollow Shaft Nutdriver 1/4"
Bondhus® 1/4" Nutdriver fits VEX EDR® Standoffs and features a hollow shaft, making it possible to tighten easily them all the way on any VEX EDR® screw available. Hexagonal upper shaft can be used with a wrench for extra torque. Ergonomic non-slip handle with an anti-roll design makes this tool easy to use. Hollow shaft length of 3" and total length of 7.3"
Path: Home > Tools > Nut Tools > Bondhus® Hollow Shaft Nutdriver 1/4"